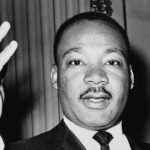 Today is Martin Luther King Jr Day, a holiday whose purpose is to honor the civil rights leader, who would have turned ninety years old last week. Unfortunately the U.S. is currently stuck with an illegitimate “President” who represents a violation of everything that Dr. King stood for and fought for. Worse, Donald Trump seems to think that Martin Luther King Day is about him, or that he is Martin Luther King. It all started yesterday when Vice President Mike Pence, one of the most openly bigoted men of his era, compared the openly racist Donald Trump to Martin Luther King. It set the stage for a disgusting display today in which Trump and Pence both visited the MLK memorial in Washington DC, while pretending they give a damn about the civil rights of any minority group. Trump has immigrant kids locked in cages. Pence is a raging homophobe. These men are the kind of monsters Dr. King warned us about. For all his grandstanding about Dr. King today, Donald Trump seemed to think that the holiday was all about him. His first tweet of the day consisted of dishonest bragging about his supposed economic accomplishments and a direct attack on the first African-American President of the United States. We should have seen this coming, considering that Trump’s initial foray into political punditry was centered around the racist false claim that Barack Obama wasn’t ‘one of us’ because he was secretly born in Kenya. At a time like this, we need someone like Martin Luther King to guide us more than ever. That said, voices of social progress and voices of conscience have been steadily rising up to fight back against this Trump-inspired last gasp of feeble white supremacy. Moreover, there is every reason to expect that by the next time we celebrate MLK Day, Donald Trump will be in jail awaiting trial, and that America will finally be able to move forward again on the never-ending path to enlightenment that Dr. King envisioned. In the mean time, don’t stop fighting.